This blog post is totally personal and it is just to help me remember the last few months! 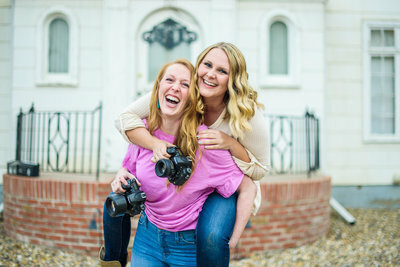 I am going to try and make it a goal to blog about my personal life every so often, so when I look back on my blog it is not only covered in beautiful faces from the past weddings & high school seniors I have photographed for my business, but also the memories with my friends, family and life that happens outside my career! In May I spent time with my best friend, Devann, in Spokane for her bridal shower. Ate lots of froyo as usual and hung out with my sweetie pie Jaselynn! I then went to Oregon to photograph my other best friend, Morgan’s, and her honey, Gary’s, engagement photos! (See them HERE!!) We did a lot of hanging out, ate Salt & Straw, hiked, did a lab workup of my bad ankle for Morg’s class, worked out with friends, and drank wine! Back in Havre I’ve been spending some mornings with some of my favorite people – Lisa & Maci! And I visited Molly & Rose in Cut Bank!! I then traveled home to begin a scary & fun new adventure acting with Fort Peck Theatre. It was hands-down one of the greatest experiences of my life! I learned so much about my abilities and myself, I made lifelong friends, I learned how to sew and use power tools, and I also never have laughed that much in my life! Back in Havre – here is my cute best friend & bomb.com second shooter, Brianna, & me before our first 2017 wedding! Then over the 4th of July, Evan got to come back to MT from NC for 10 days! TEN WHOLE DAYS!! I was so excited!! We spent four days at Placid Lake with my family & then hung out in Havre preparing for Layne & Kayla’s wedding. I thankfully only had to work two days while he was home, so I soaked up as much honey bear time as possible! Evan got his first pedicure, we went and saw Oliver at Fort Peck so I could introduce him to all my favorite friends there, we hung out at Fresno, & we made more memories together as husband and wife!! Sadly, I had to send him home last week and won’t see him again until Christmas but it is all these fun memories that make our time together worthwhile! Most recently I was in Coeur d’Alene, Idaho celebrating my sweet friend & bride, Jenna! It was the best-timed getaway during the heat of my busy season and it was so great to goof off with these amazing ladies! It also made me super excited to photograph Jenna & Matt’s wedding this Saturday! !